Great idea shared the other day at Mark Twain Elementary for how to differentiate for an ELL student who is a newcomer to the U.S.! The teacher has a clear plastic tub with differentiated materials for this student with a sign labeling it. During independent time, she assigns a different student to work with this child daily. The kids check off a list showing the day they worked with him, so they all get to have a turn. It is one of their favorite times of day, and they love working with their new friend! 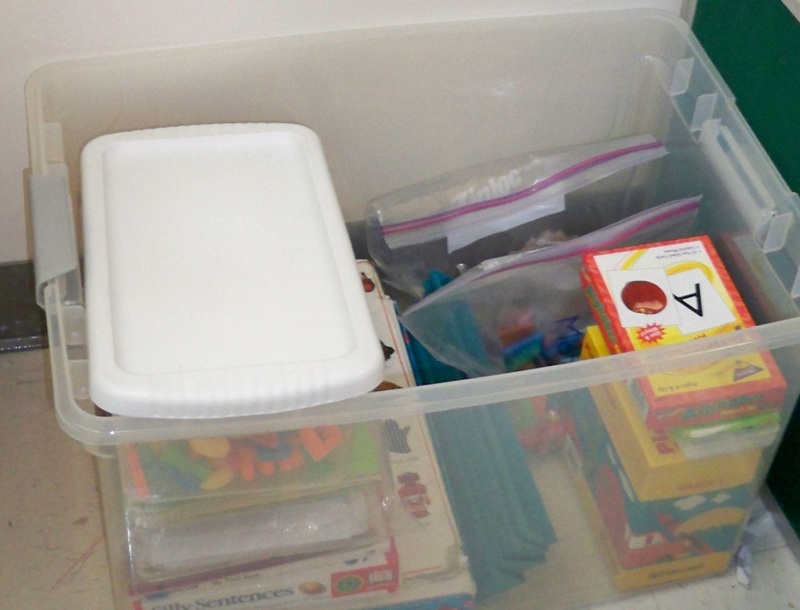 Differentiated activities for ELL newcomer are stored in a clear plastic tub. His classmates take turns working with him each day. “OK. We will do three sets of 100. The first set will be 100 regular quick jumps with feet together. The second 100 will be jumping from side to side with the rope. And the third 100 will be jumping one foot at a time as you count. You have three minutes to complete your jumps. Ready, GO!” And so it began. We all began to jump, some more successfully than others! After about 20 seconds, the instructor yelled, “STOP! Let me show you how to jump rope. Just move your wrists, not your whole arm.” (Guess I wasn’t the only one in the room who didn’t know how to jump rope!) He did a quick demo, and then said, “Now just jump with both feet together quickly. Try for 100 jumps in a minute and a half.” He then walked around and helped individuals – like me! As I participated in this experience, I kept thinking about classroom teaching. My exercise instructor had monitored and adjusted. He did a quick informal assessment and then tailored his lesson to what he saw we needed. He varied from the plan, because we needed something different. That, in a nutshell, is differentiation! We moved from jumping rope (once I finally had the hang of it!) to a new method of torture – I mean exercise! He asked Jessica to help him model how to do a kicking exercise with martial arts pads. Basically, one person held the pads and the other kicked the crap out of them with a kickboxing move. Jess told me she thought this would be a great activity for families in conflict! I, on the other hand, didn’t enjoy it all and I quit and wouldn’t try at all. (Kind of like those kids who feel like they can’t read or do math, so they stop trying.) Hmmm. I was a struggling student. I needed differentiation. So, I differentiated for myself. I marched over to the free weights and started doing bicep curls… something I knew how to do. A few minutes later, we were all doing free weights… lots more reps than I’d planned for myself. But isn’t that the point of being in an exercise class? Hope you do something physical to take care of your body today. Try something new. Jump rope anyone?? ?